At long last Ex Hex have announced the follow up to 2014's debut, 'Rips'. Mary Timony, Betsy Wright and Laura Harris will release their second album together, 'It's Real', on March 22nd via Merge, followed by a UK tour in May - details below. Today they give a first glimpse at the new material with "Cosmic Cave", a bittersweet rave-up with shimmering phased guitars, a gooey-candied chorus and beamed-in 'whoa-oh-ohs' that add a touch of melancholia to the frenzied speed-of-sound pace. When Ex Hex exploded onto the scene with their unfettered brand of rock and riffage, the power trio for our generation had finally arrived. 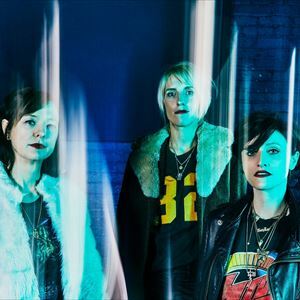 Made up of Mary Timony (guitar, vocals), Betsy Wright (bass, vocals), and Laura Harris (drums), the group's 2014 debut 'Rips' was a gleaming collection of tightly wound gems and near-constant touring throughout 2015 and 2016 established the band as a force to be reckoned with: an audacious three-piece distilling rock music to its essence with formidable skills and a reputation for frenzied and unabashedly fun live shows. On 'It's Real', the group's forthcoming second album, Ex Hex's commitment to larger-than-life riffs and unforgettable hooks remains intact, but the garage-y, post-punk approach that defined 'Rips' has grown in scale and ambition. What started as a reaction to the blown-out aesthetic of 'Rips' would test the sonic limits of the power trio and lead the band on a quest for a more immersive and three-dimensional sound. Vocal harmonies are layered ten tracks deep, solos shimmer and modulate atop heaving power chords, and the codas linger and stretch toward new frontiers of sound. On first listen, you might think you've unearthed a long-lost LP carved from the space where crunch-minded art rock and glitter-covered hard rock converge, an event horizon at the intersection of towering choruses and swaggering guitars. Produced by Jonah Takagi (who also produced 'Rips'), 'It's Real' was a more collaborative effort than its predecessor. Mary and Betsy could be found writing late into the night, leaning on Takagi to tighten up arrangements. Egos were surrendered in service to the music: Nothing was sacred or precious, and there was a relentless devotion to both songcraft and exploration. Dozens of guitar amps sat mic-ed in the next room, and the group experimented at a frenzied pace parsing countless combinations of instruments, pedals, and amps. They even dusted off Mary's old Rockman, a small headphone amp designed by Boston guitarist Tom Scholz in 1982. Mary recounts, "It's only about the size of a Walkman and takes eight AA batteries, but it sounds massive. We read that parts of [Def Leppard's] Hysteria were tracked through it, and when we finally plugged it in, it blew our minds!" Ex Hex were already one of America's best guitar band - but on 'It's Real', their musical savvy has thrillingly combined with anything-goes curiosity, studio experimentation, and a dedication to refinement, resulting in an album that's ready to be played at maximum volume. 'It's Real' will be released on March 22nd via Merge and is available to pre-order here.